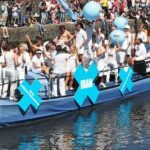 Iranian LGBTIQ and allies has been participated on the first Iran Boat in Amsterdam Canal Pride 2017. However, the plans didn’t went well and the boat didn’t finish the track because of skipper denial of service against their contract. This was the first time that a boat has been stranded in the whole 20 years of Amsterdam Pride experience like this. 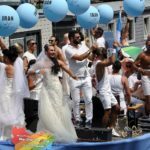 This was the reason that Amsterdam Pride Foundation (AGP) has been awarded the Iran Boat a wildcard to participate in Amsterdam Canal Pride 2018. This award means that Iran Boat will sail among other 80 boats without going through selection process next year. Agree with terms & conditions? There is a huge attention an the Iran Boat that is an initiative of Iranians in the Netherlands. Veel aandacht ging dit jaar ook uit naar de 'Iran'-boot, een initiatief van Iraniërs in Nederland. While being queer is still a crime in 73 country like Iran, it's important to have Pride Parade. Creative Commons Attribution v.4 International.